One basic requirement received not too long ago prompted me to think about how to make this look pretty. 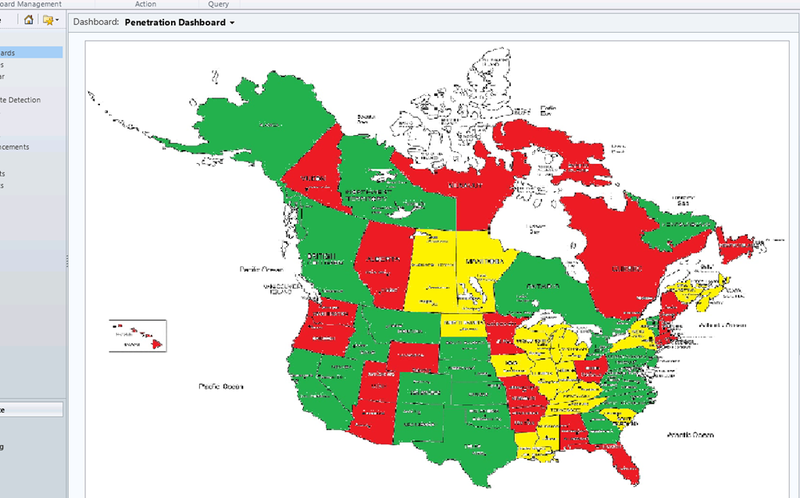 I needed to show states/provinces by penetration in a nicely formatted dashboard. The prep. work includes the creation of 3 map images for each state/province, using a set of defined colors, let’s name them Red/Yellow/Green. The percentages are irrelevant, you can set them up as required. The work around the images is pretty important, as we will need to save them with transparency, and properly aligned so they overlap nicely. Additionally, we will create a html resource, which is the actual page that we load the images onto. Scripting is also pretty simplistic. First off, we have a process behind that calculates the state/province rating based on a formula. We will only define a custom field on the Account form that will hold the resulting value, as one of the three colors (options). As part of the setup, and in this case it worked based on the business model, we have one Account for each state/province, with multiple child accounts. Each URL of the hot spot areas defined will point to one Account on the system. We can either do this static, or dynamic by looking up the account by name or abbreviation (e.g. AB, IL, FL, etc.) I prefer abbreviation, as it is less typing. Additionally, since we already have the resources in place, we can also enhance each account with a small image of the state/province, colored according to the penetration rating.